"We're all human, we're all capable of amazing things." We all have dreams. Unfortunately for most of us, they are eventually destroyed by a combination of inaction, pessimism, and the mundaneness of practicality. While we do see a handful of people actually fulfilling their ambitions, countless more fall by the wayside in the face of the harsh realities that can dampen even the greatest aspirations. Lionheart: The Jesse Martin Story is a testament to the will to follow your dreams, no matter how implausible they may be. The contents of this DVD are some of the most inspiring I have ever witnessed, made even more poingnant by the person who made them come true. From his low key departure to his triumphant return 27,000 nautical miles and 328 days later to a crowd estimated at 25,000, this is the story of a boy who conquered his adversities and made his dream a reality. Circumnavigating the globe is a feat that has bested even veteran sailors. The extreme weather conditions have foiled the attempts of many experienced crews, and cost them their lives on numerous occasions. For one 17-year-old, German born Australian native, Jesse Martin, it was an adventure he had dreamed of, and with the assistance of his family and corporate sponsors, was an undertaking he would push through to its fruition. His dream was to sail around the world solo, with no stop on land for the projected nine months it would take. Skeptics dismissed the idea as dangerous folly, as seasoned sailors knew the risks involved on the high seas, but the thought of a teenager with only three month's training, who had never left the sheltered waters of the local harbor, seemed ludicrous. Jesse had other ideas. At 16, he had led a 328 mile kayaking expedition through the wilds of New Guinea, and was inspired by the excitement of the adventure. If he could bring his dream to reality, he would be the youngest person ever to sail around the globe, but the plan was not without its obstacles. First, he needed a boat. As the son of divorced parents, this meant his mother had to mortgage her home to finance it. He and his father scouted for the right vessel, and found a 34-foot yacht they dubbed "Lionheart." Jesse would have only 3 hours solo experience with the craft before undertaking his journey, though he had intensive study in survival skills and some team sailing experience prior to departure. Criticism from all sides got the project off to a rough start, including the yachting community that felt the boy's inexperience could cost him his life, and even his parent's coworkers couldn't believe that they would let their son embark on such a perilous undertaking —his mother eventually quit her job as a result of the negative atmosphere that developed. Jesse's determination was steadfast, however, and when he approached Matthew Gerard, a local business man, with his proposal for financing, he got a surprise break. Sensing Jesse's commitment to the project, Gerard agreed to finance the journey, and sponsors finally came on board to outfit the "Lionheart" with the tools necessary to support the boy on his trip, including food rations for nine months, since Jesse would not touch land or put to port for the duration. It also included a satelite phone, a computer, and digital video cameras for documenting his journey. It is that footage that makes up the bulk of this documentary, and here is where we see, firsthand, this incredible experience. What was meant as a nine-month voyage turned into eleven. As someone who hadn't heard of Jesse Martin until I saw the announcement for this DVD, I had no idea what to expect, and was somewhat certain I'd made a poor choice when the disc finally arrived—I couldn't have been more wrong. Documentaries can often be boring, but this is certainly not the case here. Set to a great soundtrack featuring sonicanimation, Midnight Oil, Heather Nova, Hunters and Collectors and Dead Star, Jesse's breathtaking location footage is exquisitely intercut with interviews with Jesse and many of the other people involved in the process; his mother, his financier, his meteorologist and some of the yachtsmen who attribute his success to luck with the weather. These scenes are juxtaposed with Jesse's video diary, which captures the essence of his story, from the joys of sailing with dolphins, to the fear and desperation of braving the South Atlantic storms that could easily have cost him his life. The footage is wonderful, as the warm and humble personality of this young man develops before our eyes in its excitement, frustration, melancholy and wonderment. We share his first sight of land in four months as he reaches Cape Horn, the day to day routine aboard ship, quiet reflections at sunset, an emotional reunion with his family halfway around the world, and the intensity of the storms he would face on his voyage home. The footage is candid, powerful and emotional. Despite his notoriety, Jesse remains very humble about his achievements, noting that he had no special qualifications, other than determination, and that he hopes his story inspires others to pursue their dreams. His interaction with school kids via newspaper articles became an instant success in the classroom. As the trip progressed and his story hit the media, he became a celebrity, capturing the imagination of people the world over, including former president Bill Clinton, whose correspondence to Jesse is included on the disc's insert. While the journey is central to this film, it is the inspiration it embodies that is the heart of the documentary. Dreams can be realized, the impossible can be overcome and, for those willing to make the sacrifice, anything is possible. This gets my highest recommendation. Image Transfer Review: Shot on digital video, Jesse's location footage is remarkably clear and well presented. Colors are, aside from some interior shots, vibrant, with solid black levels. Interview footage it letterboxed, and also well transfered. The source looks to be perfectly preserved here, and any shortcomings are due to the technology used to capture the images, which at worst are a little oversharp in a few of the news based sequences. Considering the conditions under which this was filmed, this is fantastic. Audio Transfer Review: The stereo soundtrack is rich, broad and full spectrum, especially during scenes with underlying music. Interview footage is clear and well engineered. Audio from the boat varies depending on the weather conditions, but is generally—andsurprisingly—good, being captured only by the video camera. No complaints here. Extras Review: A 19m:52s documentary combines more interview footage with some of the backstory on Jesse, his journey, and the aftermath of his historic voyage, which has included numerous interviews, writing a book, plans for another sea excursion and creating a travelling classroom. Similar in style to the feature, we get the story from a slightly different angle, featuring Jesse's business partners in a more prominent role, and Jesse's thoughts on his place as a role model for kids around the world. A Jesse Martin biography is also included. The liner card features a letter from former president, Bill Clinton. My only complaint with this release is the case, which seems easily prone to breakage. 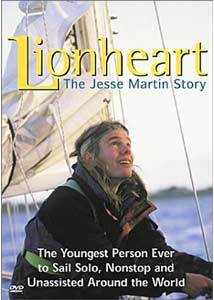 Lionheart: The Jesse Martin Story should be required viewing for everyone, and will appeal equally to all ages. The incredible story of a young man who lives out his dream of circumnavigating the globe solo is an emotional and inspiring documentary. Exquisitely edited, and filled with dramatic location footage, this is a story not to be missed. It is a testament to the strength of human nature to face adversity, conquer all odds and emerge triumphant. Very highly recommended.